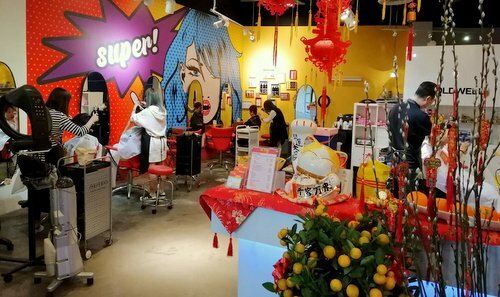 Hair & beauty concept salon In-Trim Hair operates within Singapore’s Aperia shopping centre, at 12 Kallang Avenue. Established by Jessie Siaw in 2001, In-Trim Hair has stylists that will work with you to help you discover your unique looks at reasonable prices. The hair salon has earned a specialist reputation for their skills in haircuts for women & men, especially for those with curly hair. In addition to haircutting, coloring, and perms, In-Trim also has hair treatments for different conditions and needs, including their popular anti-frizz treatment. The salon is part of Singapore’s Hairdressing Goes Digital program, featuring the use of Veon Hair Experience Technology in their services. The official In-Trim Hair Facebook page is located at www.facebook.com/intrimhair/. You can also follow the official In-Trim Hair Instagram account, which in turn is available at www.instagram.com/intrimhairsalon/.